Challenging New Foes – Battle the denizens of Shivering Isles, a land filled with hideous insects, Flesh Atronachs, skeletal Shambles, amphibeous Grummites, and many more. First-Person Melee and Magic – An all-new combat and magic system brings first person role-playing to a new level of intensity where you feel every blow. Live Another Life in Another World – Create and play any character you can imagine, from the noble warrior to the sinister assassin to the wizened sorcerer. New Lands to Explore – In the Shivering Isles expansion, see a world created in Sheogorath’s own image, one divided between Mania and Dementia and unlike anything you’ve experienced in Oblivion. 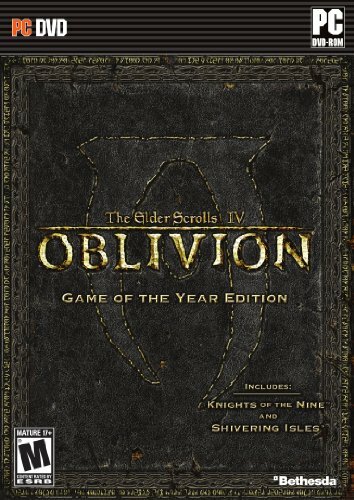 Radiant AI – This groundbreaking AI system gives Oblivion’s characters full 24/7 schedules and the ability to make their own choices based on the world around them. Non-player characters eat, sleep, and complete goals all on their own.